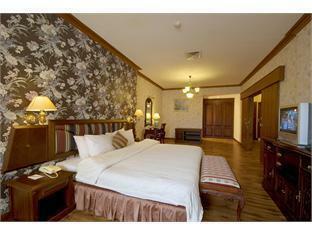 The Goodway Hotel is located in Batam Island (Indonesia) making it one of the best hotels to stay at while in town. The hotel provides all the amenities that today's travelers desire in all of its 268 rooms. Each guestroom is fully equipped with air conditioning, bathrobes, desk, hair dryer, ironing board, in room safe, television, television LCD/plasma screen. Hotel facilities offered at this Batam Island (Indonesia) accommodation include 24hr room service, shops, coffee shop, laundry service/dry cleaning, meeting facilities, restaurant, safety deposit boxes. Leisure and sports facilities available on the hotel's property comprise massage, indoor pool, pool (kids), jacuzzi, gym, sauna. Modern comfort and convenience are seamlessly combined to ensure the guests' satisfaction. To book a room easily at the Goodway Hotel, please submit your travel dates and proceed with our secure online booking form.